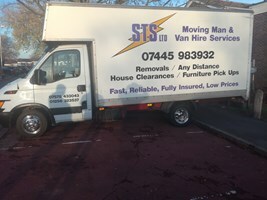 STS Van and Man Hire Services Ltd - Removals/Storage based in Basingstoke, Hampshire. STS Van and Man Hire Services Ltd.
At STS we are focused on providing excellent delivery services with the highest levels of customer satisfaction we will do everything we can to meet your expectations. With a variety of offerings to choose from we are sure you will be happy to work with us. We do everything from a single item delivery to full load furniture removals and house clearance. We are a family based company in Basingstoke. Have a look round our web site,and if you have any comments or questions please feel free to contact us. Please visit us on Google to see some of our reviews. We operate anywhere across the UK and Europe.